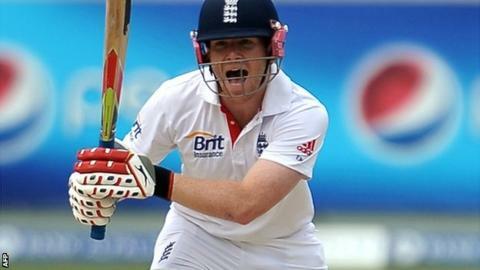 England batsman Eoin Morgan has been omitted from the Test squad for the two-Test tour to Sri Lanka next month. The left-hander scored 199 runs in 17 innings on the tour of the United Arab Emirates and averages just 30 in Tests. Ravi Bopara, who hit two fifties in the one-day series win over Pakistan, will vie for a place in the middle order with the uncapped Samit Patel. James Tredwell is a fourth spinner in the 16-man squad, while fit-again Tim Bresnan boosts the seam bowling ranks. It is a change of philosophy for England, who chose five seamers and two spinners for the tour to the UAE. Graham Onions, who had replaced the injured Chris Tremlett on that trip, is not included, while Morgan is the only batsman to make way after the disastrous Test campaign, where only wicketkeeper Matt Prior averaged above 30 as Pakistan won all three matches to inflict England's first series defeat since 2009. Ian Bell, who amassed 235 in his final innings of last summer against India, scored just 51 in six innings, while Kevin Pietersen compiled only 67 in that series but returned to form in the one-day matches with successive centuries. After several match-winning innings in one-day internationals Morgan made his Test debut against Bangladesh in May 2010 and struck his maiden century in his third innings against Pakistan later that summer. The 25-year-old Middlesex batsman made another hundred against India last year but scored just 82 runs at an average of 13.66 in the Test series whitewash against Pakistan. "Morgan's biggest problem now is how is he going to get back in to the Test side. He is going to play in the Indian Premier League so he's not going to get the chance to play for Middlesex in four-day cricket at the start of the season and stake a claim for the West Indies series, starting on 17 May." England coach Andy Flower said: "He's had a tough tour of the UAE, we've been here for two months and it's been hard work for him. "He has got some work to do I think on his Test game - that's going to be quite difficult for him considering his next cricket is going to be IPL [Indian Premier League] cricket. "When he comes back he'll have limited exposure to opportunities to get four-day cricket under his belt so he has got to go away and give some serious thought to his method in Test cricket. "I still think he has a very exciting future in Test cricket, he's only 25 years old and he's a very talented player, a very confident player and a very dangerous player." Asked about the inclusion of four spinners, national selector Geoff Miller said: "We have selected a squad that we feel will be able to make best use of the conditions we are likely to encounter in Sri Lanka. "There is no doubt that this Test series will be a challenging one but it is exciting that players have an opportunity to demonstrate that they have learnt from the disappointment of the Pakistan Test series and can make further strides in developing the skills needed to succeed on the subcontinent." Kent spinner Tredwell took six wickets in his only Test appearance against Bangladesh in Dhaka in March 2010. The 30-year-old said he was surprised to earn a recall two years later. "I guess you hold a faint hope at the back of your head that if a situation does arise your name is first on the list, and hopefully that's the case," he told BBC Radio 5 live. "Initially I'm there as cover but in that part of the world you never know because the wickets take lots of spin. "Samit gives us a batting option so he could be the third spinner but I've got to be prepared to have a go. You need to do everything you can to keep your name in the hat and who knows what will come from that."